We’re starting back to school on Monday! We’re all just a little bit excited at our house. So, here’s a fun giveaway to kick off the start of a new school year. 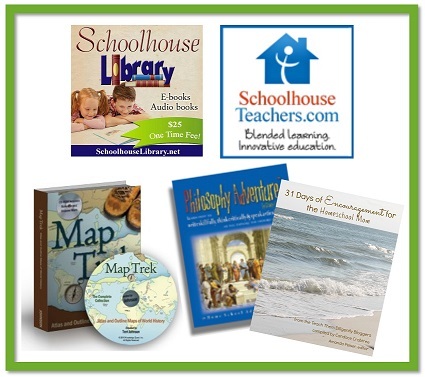 And because we couldn’t possibly have a Back to Homeschool giveaway without some homeschool curriculum and encouragement, a second reader will win this awesome prize package, a $309 value! Be sure to come back every day this week for my blog series Effective Homeschool Habits. And don’t forget to carve out some time to read all the other amazing series that will be posted on the Schoolhouse Review Crew blog hop. It’s 5 days of Back to Homeschool fun and encouragement from 90 bloggers. Wow, either prize would be amazing! I would love to win either prize! Thanks for the opportunity! 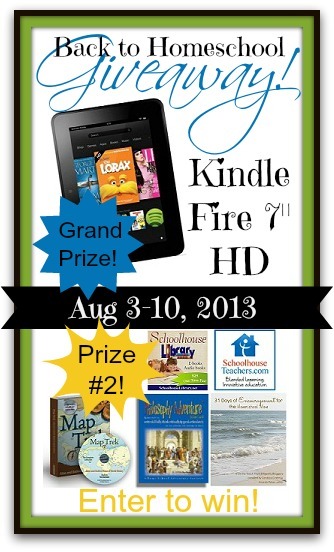 I would love to win the Kindle for my rising 8th grade son. Thanks for the chance! Sounds like a great giveaway to me! Thank you so much for posting this giveaway! 🙂 Someone will be super blessed with that prize pack. Have a blessed school year! Yay! The Graves' family would love the kindle tablet! We have many readers over here and we're in the car a lot! Thanks for the chance!